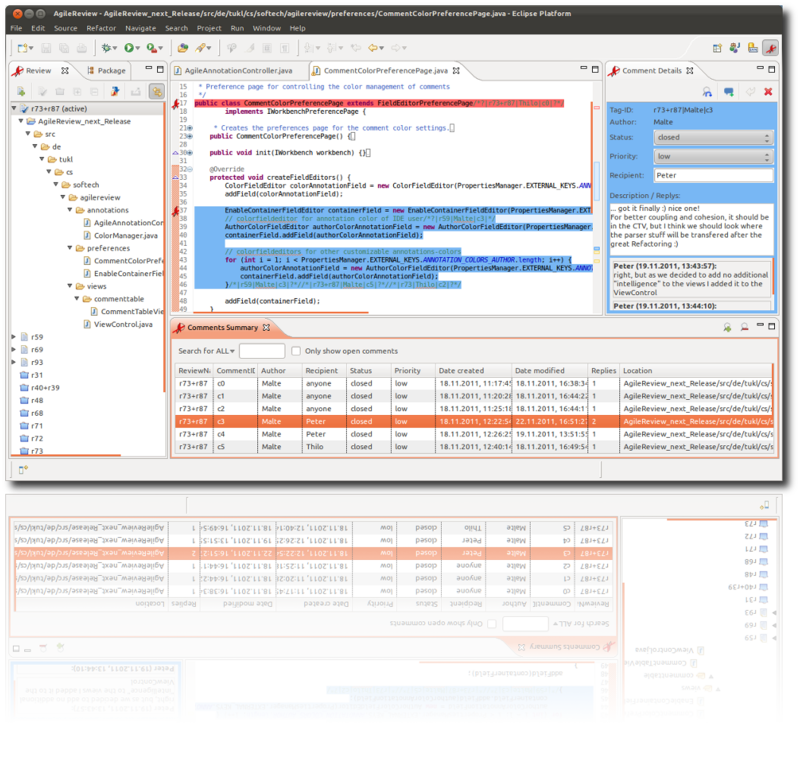 AgileReview is an Eclipse plugin that lets you easily conduct code reviews. Learn the basics in less than 10 minutes using our Quickstart Document or the Introduction Screencast. The Screencast will show you how to manage reviews, comments and replies and gives you a general overview on the AgileReview plugin. Agile Review offers you seamless Eclipse integration. All major activies during reviewing such as adding comments, reviews and replies are supported by keyboard shortcuts. Still want to use Excel for analysing your review process? AgileReview provides you with an Excel-Export functionality. Furthermore, a basic export template using Excel Pivot Tables and Charts is provided. Directly comment pieces of code. Add comments to the latest version of your code using your preferred Eclipse editor. Commented code snippets will be highlighted. AgileReview will maintain the locations of your comments even when the code changes. Share your reviews and comments with colleagues from all over the world e.g. by using versioning tools. Comments and reviews are stored as plain XML files. Tools like the Subversive Eclipse plug-in can be used to commit changes to a SVN repository. agilereview-project.github.io is maintained by AgileReview-Project. This page was generated by GitHub Pages.